Clear Creek Park resides on 101.7 acres. The park was initially purchased as 2 individual tracts of land; the Ragland Tract and the Burger Tract. The Ragland Tract was purchased by the Anderson Township Trustees in 1992. The Burger Tract was jointly purchased in 1993 by the Anderson Township Trustees and the Anderson Park District. The Trustees deeded this property to the Anderson Park District in late 1993. The Bicentennial Celebration, in 1993, provided the initiative for the acquisition and development of additional park land for Anderson. Clear Creek Park opened in the late summer of 1996, as the first phase of a continuing building program. In 2000, the Park District acquired an additional 35 acres of adjacent property, containing a national registered pre-historic site. This addition makes Clear Creek the 101.7 acres it is today, making it Anderson Park District’s second largest park. Clear Creek has capabilities for up to 23 irrigated athletic soccer fields of varying sizes. The fields are available for use by permit only. The Anderson Township Bicentennial Commission raised funds for part of the development. Additional improvements will be added to Clear Creek as funds become available. Following the park’s construction, the Ohio Department of Transportation (ODOT) mandated that turn lanes be added to the entrance/exit of Clear Creek Park in order for the park to continue to function. The turn lanes were initially to be funded through the 1997 additional levy for capital improvements. When the levy did not pass, the Park District regarded the status of the turn lanes a top priority. Bonds were sold to generate the revenue to finance the project. Had the Park District not taken such action, ODOT could have closed Clear Creek Park, regardless of the number of fields being used at any given time. The bonds will be paid back over 15 years. The turn lane project was completed in November 1998. An Award Winning Park District of which to be proud! Anderson Park District was awarded the prestigious “Management Innovation / Special Project Award” by the Ohio Parks and Recreation Association (OPRA), for “The Oasis” project. The project was chosen based on outstanding management creativity, interagency cooperation, and cost effectiveness. In 1997, the Park District and 130 teens from the tri-state area youth of The Church of Jesus Christ of Latter-Day Saints, cooperated to raise ‘The Oasis’. The Oasis is an elevated, arbored framework housing concession and restroom facilities. The teens selected this project from a number of other possibilities during their annual youth conference. Clear Creek Park is located in the flood plain of the Little Miami River Valley on State Route 32. Budget and construction obstacles were the concerns for the Park District. Building such amenities within a flood plain requires immense creativity to avoid the repeated expense of cleaning and repairing permanent restroom and concession facilities, following annual floods. The solution was to place portable trailers within an arbored framework, giving them a facade of permanence while allowing for quick removal with minimal warning time of rising waters. The cost effectiveness of the design, coupled with the assistance of the youth, made this project unique. The Oasis stands as the focal point of Clear Creek Park for everyone to enjoy, while serving as a permanent legacy of community involvement. The benefit to the community, as well as to those who helped build it, will last for many generations. The Anderson Park District’s Oasis Project was selected from eleven Parks and Recreation projects, from around the state of Ohio, including the Hamilton County Park District, the City of Columbus, the City of Toledo, and the City of Cincinnati. The 2,250 foot link of the Ohio River to Lake Erie Trail was made possible by a matching grant from the Ohio Department of Natural Resources. In 2014, the Park District found partners to help provide 110 more paved parking spots for Clear Creek patrons. The permeable pavers will help eliminate surface water pollutants and reduce surface runoff water into the Little Miami and Ohio rivers. 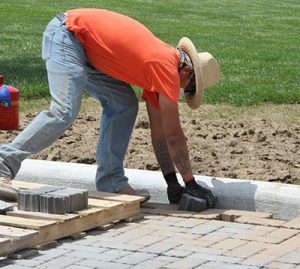 Click here to learn more about the benefits of permeable pavers. Permeable paver project was financed in part through a grant from the Ohio EPA. In 2016, six pickleball courts were installed. Pickleball is a sport that combines tennis, badminton and Ping-Pong, and it has been growing in popularity around the country.